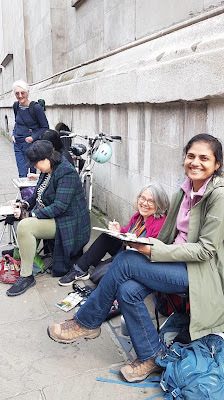 (Nicky Browne writes) The warm Spring sunshine shone on a very large crowd of Urban Sketchers when we met in Spitalfields to sketch on Saturday 30 March 2019. 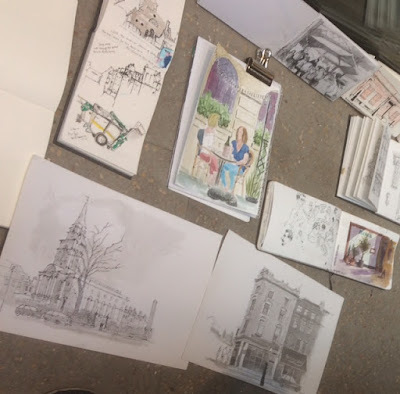 Spitalfields is an area bursting with a wide range of subjects to draw. These range from Nicholas Hawksmoor's Christ Church to the late Victorian Old Spitalfields Market, to the Georgian streets surrounding the area. Artists Tracy Emin and Gilbert & George have houses in Georgian Fournier Street, which leads down to Brick Lane. Tracy is reputed to drink at the exquisite Ten Bells on the corner of her street, but she stayed indoors while we were there. 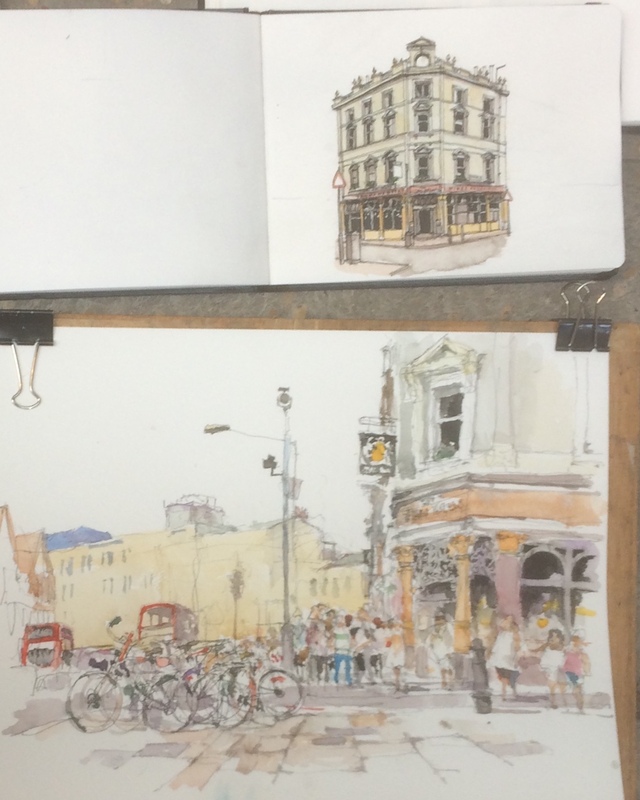 The market itself is wonderful for people watching on a Saturday. 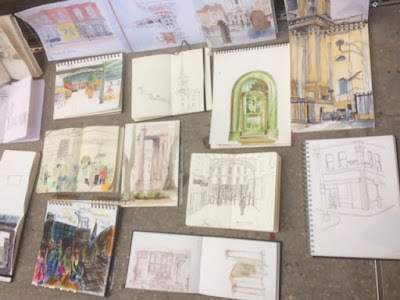 It is a vast warehouse of stalls selling food, clothes, jewellery, accessories and a wonderful hat stall presided over by a man in a top hat and a gold earring. 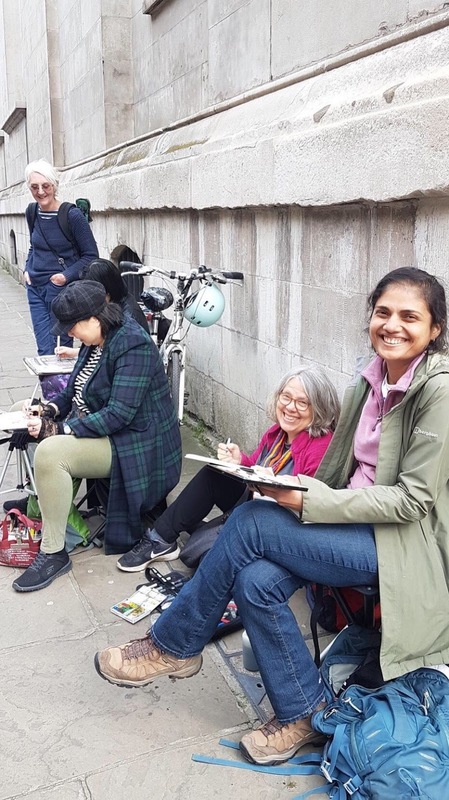 Our next meet-up will be on Saturday 27 April when we sketch in Croydon – details are elsewhere on this blog and we hope you will join us. Photographs are by Nicky Browne and Helen Hayhoe.